Luggage that doesn’t get lost? This must be a fantasy novel. After shooting off the edge of the Discworld in The Colour of Magic, Rincewind and Twoflower are magically returned to the Disc for reasons unknown. The world turtle, Great A’Tuin, is swimming through space, excited about the red star it is approaching. The Wizards have noticed the red star and the magical change that allowed Rincewind and Twoflower to return, allowing them to uncover an ancient prophecy. Can the prophecy be fulfilled before Great A’Tuin reaches their destination? When I finished The Colour of Magic I was a little peeved. Whilst a continuing story cliffhanger is a common fantasy trope, a book satirising fantasy tropes should surely rise above such shenanigans. That downgraded my rating to 4 stars. Happily, The Light Fantastic finished the story started in The Colour of Magic in a highly entertaining fashion. I especially enjoyed the introduction of Cohen the Barbarian, being a fan of the Robert E Howard stories. Death and the other horsemen learning Bridge had me grinning for days. I wouldn’t rate this as one of Pratchett’s best Discworld novels, but it certainly started the ball rolling. Believe in something. Anything. No, not that. No, best not that either. It’s Hogswatch, the time of year for carol singing, presents, warm alcoholic drinks, and giant department stores to sell lots of stuff. But some “people” have hired Mr Teatime (Teh-ah-tim-eh) to stop the Hogfather bringing presents and drinking sherry. Can DEATH and his granddaughter Susan help? To get in the festive mood this year, I decided I needed to read an appropriate book. Rereading the Hogfather was an obvious choice. HO-HO… oh yes, HO. There are many of my favourite characters in this novel, DEATH and Susan being prime examples, as well as some very memorable others, Mr Teatime if only for the proper pronunciation of his name. It is also such a wonderful satire. I think that I enjoyed this novel more upon rereading than the first time around, which means I’ll have to make sure my copy stays on my bookshelf. Scarface Claw: The Toughest Tom In Town. This time last year (2017) my family and I attended the book launch of the latest instalment in the Hairy Maclary (from Donaldson’s Dairy) series by Lynley Dodd. Hairy Maclary and his friends have been entertaining people, particularly younger people with an as yet undeveloped world-weariness, for 30 years. The latest book in the series is titled Scarface Claw, Hold Tight! and I’m left with some very important questions. For those who aren’t aware, Scarface Claw is the toughest tomcat in the town where Hairy Maclary and his friends live. Which town this happens to be and the relative toughness of the other tomcats living there is not explored in any detail in the series, which could be regarded as an oversight. Scarface Claw has, on more than one occasion, threatened or utilised violence against the cats and dogs in town. This has seen scatters of paws and clatters of claws from Schnitzel von Krumm with a very low tum, Bitzer Maloney all skinny and bony, Muffin McClay like a bundle of hay, Bottomley Potts covered in spots, Hercules Morse as big as a horse, and Hairy Maclary from Donaldson’s Dairy. Obviously, this nasty, violent, and abusive cat makes for an ideal protagonist in a children’s book. Scarface Claw, Hold Tight! marks the tomcat’s second outing as the hero. This adventure sees our cranky and crotchety hero sunning himself on top of Tom’s car. Somehow, Tom manages to not see the rather large black tomcat sprawled on the roof of his red car and hurries off to somewhere very important – another detail unexplored by the narrative. Since this is the inciting incident of the story, you would expect it to be more believable. Are we to seriously believe that Tom doesn’t notice old Scarface? As we soon discover, literally everyone else in the town notices Scarface Claw clinging to the roof of the car, so either Tom should be required to acquire prescription lenses for driving or he knew Scarface Claw was there all along. That Tom knowingly drove around town with a cat on his roof is not inconceivable. Scarface Claw has a long and infamous history, particularly amongst the resident town pets, so mistreatment of the tomcat may be a common occurrence. It may be that this mistreatment is what makes Scarface Claw the nasty cat he is. Maybe with extensive therapy, Scarface Claw could become a lovable and friendly cat who would be invited to Slinky Malinky’s house in a tail waving line. We can only hope. We also have to question why everyone in town noticed Scarface Claw clinging to the roof and wanted to “rescue that cat”. Presumably, the townfolk recognised Scarface Claw, so either they are more kind and caring than Tom – plausible given my previous points about potential mistreatment – or they are starved for excitement such that waving a sock at a driver with a cat on his car roof would make it into a lifetime highlights list. But that doesn’t excuse the next issue. There are so many questions left unanswered, so many details not covered, that I am left at a loose end. I can only hope that future books in the series will address these issues in some way. *Miss Plum has a long habit of helping the town pets out of their adventurous mishaps. She seems to always conveniently arrive in the nick of time. A more suspicious person would suspect that something more sinister is at play here. Is Miss Plum stalking the town pets? Is she behind the pets’ misadventures? Hopefully, these questions will be addressed in later instalments in the series. ***And it is possible that Constable Chrissie keeps an eye on Tom and his activities – possibly Miss Plum does as well – because she suspects Tom’s animal abuse may morph into something more serious. Best to catch a killer early. The Munrungs have just had their village destroyed by fray, a natural phenomenon from above The Carpet. In the aftermath, Glurk and Snibril try to help their village flee the attacking Mouls, a people who regard all others as animals and rather good eating. It is then they realise that fray is pushing a path of destruction through The Carpet and that the Mouls are attacking every city and town in its wake. Can they save civilisation so that people don’t go back to hitting each other? While I was reading this novel I kept having to remind myself that it was the heavily revised edition written by the 40-something Pratchett, not the 20-something of the original edition. 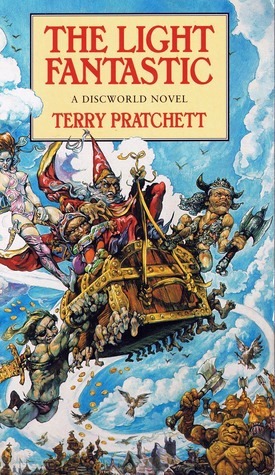 This was Pratchett’s first novel and as an ode to fantasy fiction had just the right amounts of absurdism and humour, which I can’t see a 20-something nailing. If Pratchett was this good out of the gate then every other author would be left weeping into the keyboard. Hopefully, someone who has read both versions can point out the differences. This is, of course, not a Discworld novel. Apparently, all reviewers have to point this out for some reason. As such, Pratchett’s style, particularly his satire, is less pronounced here. 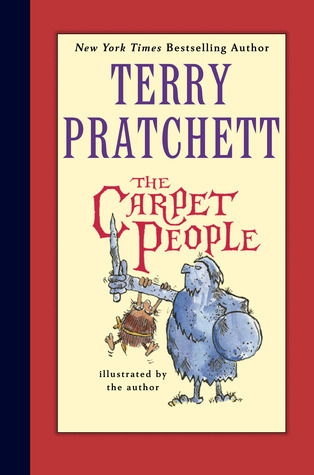 While I thoroughly enjoyed reading The Carpet People, for long-time Discworld fans this may feel a little light or insubstantial. Or maybe they just feel guilty about having vacuumed their house. Recently my family went to the Paw Patrol movie. My youngest is a (relatively) big fan and as a result, I found myself finally sitting down and watching a complete Paw Patrol adventure. And I’m left with some very important questions. For those who aren’t aware, Paw Patrol is a rescue team that spans police, fire, construction, recycling, aquatic, and aviation – with later seasons adding snow and forest services and a robotic helper. This rescue team are based in the aptly named Adventure Bay and run by Ryder and his team of puppies. Oh, was that not clear? The rescue team are composed of puppies with a series of catchphrases and dog houses that convert into vehicles. These catchphrases are very important to the show as they comprise roughly 60% of each episode; there is very little new content in any given adventure. This brings me to the crux of the issue with Paw Patrol. Adventure Bay is riddled with people in need of rescue, and in later seasons there are even nefarious plots by royalty and rival mayors to cause havoc. So it is odd that this bustling town has decided to entrust major rescue efforts, law enforcement, and fire management to a 10-year-old and his team of puppies. I’m not sure it is wise to allow Ryder to operate with such autonomy given his age. And as much as the pups have proved themselves capable, surely they are also too young and inexperienced for such important roles. * You have to question who allowed Ryder to establish the Paw Patrol and why he is allowed to continue. Obviously, it helps that the mayor – one Mayor Goodway and her purse chicken Chickaletta – are often in need of assistance due to their own incompetence. This would certainly make Ryder and his pups endearing to Goodway. She seems willing to overlook Ryder’s repeated risk-taking and near catastrophic failures, even when it inspires others to wreak havoc. Would this fly in any other town? Ryder also seems to have a suspiciously large amount of resources for a 10-year-old. The custom transforming dog houses are a marvel of technology that must have cost a fortune to make. Even if we are to believe that Ryder builds them all himself, this would require funds from somewhere, and knowledge that would have any tech company begging him to come and work for them. But new adventures see new technology introduced, seemingly overnight. Where does Ryder find time to design, engineer, and build aerial, submersible, etc, versions of equipment for his pups? ** And when did he find time to be on the cutting edge of robotics and AI to create a robotic assistant dog? I would contend that Ryder’s activities are not as altruistic as first appears. He seems to have infiltrated Adventure Bay and bribed his way to power using money and goodwill. The mayor looks the other way whilst he trains a team of puppies to do his bidding. His recklessness is all fun and games for the moment, but we will no doubt see Ryder’s true colours when one of the rescues fails and he has to show accountability. Let us hope that on that day his puppies are able to be true heroes and save Ryder from himself. *Sidenote: what happens when they are no longer puppies? Do they age out of the Paw Patrol team? Are they suddenly unemployed? Are there nearby towns/cities that take dogs with transforming dog houses, or are they abandoned to become strays? Will we one day see former Paw Patrol members return to Adventure Bay as bitter and twisted dogs bent on exacting revenge upon their former master who abandoned them? **And I haven’t even touched on his ability to defy the laws of physics with some inventions. E.g. Marshall seems to have an unlimited supply of fire suppressant in a backpack that he can comfortably carry. Is it powered by as yet undiscovered physics, or does it tap into a well of magic? Why isn’t he sharing this technology with the world? Update: According to reliable news sources, Chase has been in an officer-involved shooting. It has been confirmed that Zuma, the black Lab, was shot 17 times in the back after Chase mistook Zuma’s bone for a gun. Do sugar lumps disappear or were they never there in the first place? 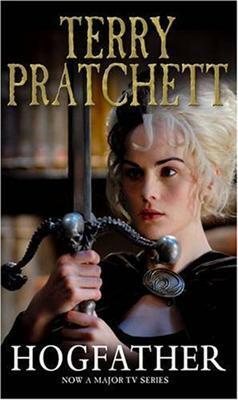 The first Discworld novel I read was Guards! Guards! so the City Watch series are always among my favourites. 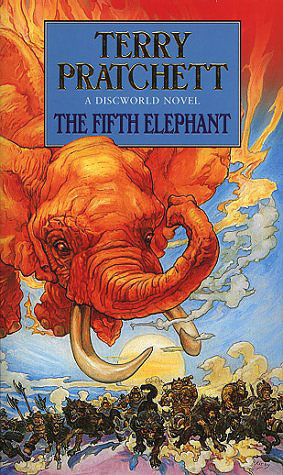 The Fifth Elephant is more plot orientated than some other Discworld novels, so it feels more streamlined and ordered than some others. That doesn’t mean that the humour or satire are lacking, even if they can be a bit subtle at times (e.g. feudalism vs capitalism commentary is rife but takes a backseat to the plot). I really enjoyed this novel. Nothing more to say really.